Everyone knows that there is nothing like a good cocktail bar to take the edge off of a hard work week. Here in Baltimore, we’re lucky enough to have more than our fair share of great spots to do just that. You may have seen our last piece on the B&O Railroad Museum. 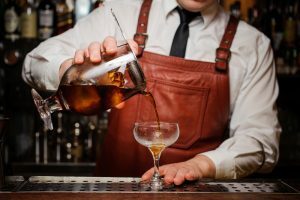 Well we’re feeling inspired again by that historic railroad with the one place you can get a B&O Old Fashioned so good you want to write home about it. Brendan Dorr, the bar’s lead bartender, is actually the founder of the Baltimore’s Bartenders’ Guild. 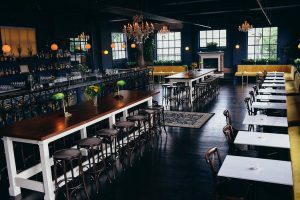 The Bartenders’ Guild has a goal of “bringing a new level of classic and contemporary cocktails to the city of Baltimore, while providing guests with the best quality of service,” (www.bmorebarguild.com). One of the best things about a good cocktail bar is that they can pair your drink with your food for you. Inviting you to enjoy “the art of the drink,” Rye specializes in, you guessed it, whiskey. In 2014, this well-regarded bar even received local and national acclaim as one of the “Best Bars in America” by Esquire. Rye’s mission is to help pave the way for Baltimore’s craft cocktail mission. They love Baltimore so much they even serve some of their cocktails straight out of a Natty Boh can. How much more Baltimore can you get than that? Zagat rated, The Brewer’s Art is located in a former two-story mansion. This establishment has a dining room and a casual space below. 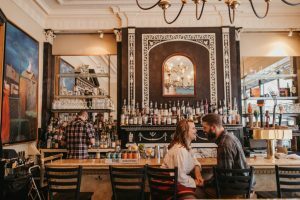 While this spot has some amazing food, it has some incredible cocktails (and brews) to boot. It’s easy to “fill up on beer” because the “house made” Belgian-style brews are “affordable and delicious” (Zagat.com). You’ll definitely get a certain vibe here as most people will tell you it’s quite dark (might need a cell phone to see the menu). But that is all part of the charm! Named after Ida Bell Wells-Barnett, an African-American investigative journalist, educator, and early leader in the Civil Rights Movement, this is not a spot to miss! Come here for a true mixologist and some good old modern soul food and you will not be disappointed. Many come here particularly for brunch to enjoy a nice mid-day treat. Overall, there are four areas for guests to enjoy: the bar, the parlor, the drawing room, and the main dining room. Even cooler is that this local hotspot is in a landmark building, the historic CJ Youse Candy Box Factory. Many of the original fixtures — including the doors — have been reclaimed and reused for Ida B’s Table. If you are looking for a more laid back feel and maybe a pool table, Spirits Tavern is your kind of thing. With the average drink costing around $5, you can really relax and enjoy yourself here at this true neighborhood bar. If you’re hungry, you might want to try the fish tacos. This is definitely a local favorite “dive bar” option. In the mood for a good scotch? With over 120 single malt scotches, look no further than Birds of a Feather. With a nautical vibe and a crackling fireplace, you can settle in pretty quickly here. We will warn you not to come hungry, as they only offer chips as their pub fare. A charming gastropub, “OLAR” has a bit of a rustic/lodge feel to it. The perfect atmosphere for a good stiff drink. You are sure to find a unique cocktail here that you will love. While you can get a great meal here too, you may find yourself spending most of your time picking through the cocktail selection on the menu. Plenty to choose from! You can’t go wrong when the place is an actual distillery. The Sagamore Rye Whiskey made in house makes a great Manhattan cocktail in the aptly named “Charmhattan.” This distillery is truly devoted to putting Maryland back on the map as the premier distiller of Rye Whiskey. Sagamore Spirit’s 8-time award winning Straight Rye Whiskey uses spring-fed water from Sagamore Farm. A classic choice if you’re in the mood for a good drink from our local makers. Did we leave something off the list? Let us know your favorite spot in the comment section below!